Naturewatch message: remains the same as it's been since plans to cull badgers were first announced: Naturewatch calls upon the government to adopt a genuinely science-led policy, focusing its resources on the only humane approach. The priority should be on preventing the transmission of the disease on farms through improved bio security to keep cattle and badgers apart, including measures to keep badgers out of farm buildings and feed stores, limiting the transfer of TB between cattle, and making swift progress towards producing fully functional vaccines for both badgers (oral) and cattle. A costly mistake that won't solve TB in cattle. Badgers are set to become slaughter victims as the government plan to shoot free-roaming badgers at random, inevitably leading to horrific injuries and terrible suffering for many badgers. It will also wipe out huge numbers of healthy animals and could easily eradicate whole populations. Culling will also effectively open the doors to increased levels of badger persecution and encourage vigilante groups to go out at night and shoot badgers at will. The decision goes against a mountain of powerful scientific evidence that proves shooting badgers will have little impact in controlling TB among cattle herds and is simply a knee-jerk response to keep the farmers happy! Believe it or not, just two months after coming into office, Caroline Spelman (replaced by Owen Paterson) cancelled five out of the six badger injectable vaccination trials started by the Labour government making it clear that DEFRA had already made up their mind to cull regardless! It was a Conservative government that initiated the Kreb’s Trials (Randomised Badger Culling Trial – RBCT) - the world’s biggest ever scientific study into the issue. The Independent Scientific Group (ISG) spent over £50 million on a massive pilot cull of around 11,000 badgers between 1997 and 2007 to decide that culling is not the solution. The trial showed that bTB in the culling area was only marginally reduced. Outside the culling area, it actually rose, a result of perturbation. Removing a reservoir might seem like a logical approach to disease management, but there is a fundamental aspect of badger ecology that results in culling making the problem worse when put into practise. Badgers stay largely within their social territory. 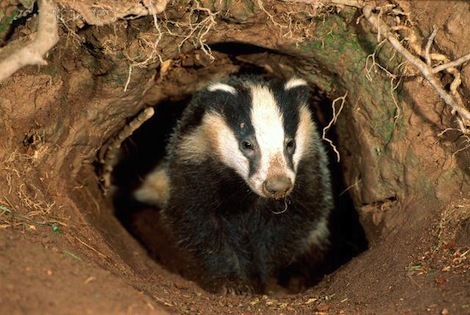 Disruption, through culling, causes perturbation meaning that previously stable groups split up and badgers move into adjacent territories, carrying bTB to other farms and increasing incidence in herds on the edge of the target zone. Lord Krebs, who conducted the RBCT, said: “The trial evidence should be interpreted as an argument against culling. If you cull intensively for at least 4 years, you will have a net benefit of reducing TB in cattle by 12% to 16%. So you leave 85% of the problem still there, having gone to a huge amount of trouble to cull a huge number of animals.” ....." I can't understand how anybody who's looked at the science would say this is a good idea." Natural England, the Government body responsible for licensing culls, has stated that it has a “low level of confidence” that Defra’s plans will yield results. English Nature, the Government’s own official wildlife advisers – pointed out to ministers, culls in the Seventies and Nineties “proved ineffective at preventing a rising incidence of the disease in cattle”. Bow Group, Conservative think-tank, call for cull to be scrapped. The report, 'Common Sense and Bovine TB', presents the reasons why they believe culling is not the answer. The Group highlights that the government should be focusing its efforts on badger vaccination as trials have reduced incidences of TB by almost 74%. Caroline Lucas, Green party, said: "The go-ahead for a barbaric slaughter of badgers shows a shocking disregard for animal welfare – and flies in the face of scientific evidence on the spread of the disease as 80% of bovine TB transmission is thought to be caused by cattle-to-cattle infection. Given it is a respiratory disease, this high rate can be attributed to the trend towards intensive dairy farming, in which cattle are kept in crowded conditions."....... "I'd like to see the Government investing in vaccination and reducing the spread of cattle to cattle disease, rather than undertaking a programme of mass slaughter that lacks any scientific credibility." It is Naturewatch’s opinion that the government has been heavily influenced by the National Farmers' Union who are working hard to ensure culling goes ahead. There is a very good reason for this - it does not wish to accept that today's agricultural practices are largely responsible for TB in cattle. Research suggests that the main causes of the spread of bovine TB are the intensive rearing and breeding practices of the farming industry and the wide transportation of cattle. Illness spreads rapidly within overcrowded intensive farms and then transportation and markets spread disease around the country with live export spreading it even further. The general welfare of cattle today is compromised due to intensive farming methods and their immune systems are not being aided by old fashioned pasture feeding when they would have selected the good grass and wildflowers. Some farms operate a strip feeding system which forces cattle to eat dirty grass and some farmers are even keeping calves knee deep in muck! Bovine tuberculosis (bTB) is a chronic airborne respiratory disease caused by the bacterium Mycobacterium bovis (M. bovis), which can also infect and cause TB in badgers, deer, goats, pigs, camelids (llamas and alcapas), dogs and cats, as well as many other mammals." It can take years to develop and, due to the slow progression of infection, the clinical signs of bTB such as weakness, coughing and loss of weight, are now rarely seen in cattle in GB. How has NI achieved a sustained fall in bTB infection in cattle?